Europeans Seeking Reinsurance Solvency again! Solvency II is the updated set of regulatory requirements for insurance firms that operate in the European Union. Based on this new European regime, Aon Benfield reports in a press release [November 4, 2010] that the formulas for calculating natural catastrophe capital requirements under the proposed Solvency II Standard Formula are outdated and ignore 15 years of evolution in the field of risk modeling. In response they are offering a suite of services to help re/insurers [game the system] make the most of the catastrophe requirements. Andrew Appel, chief operating officer of global broker Aon, will leave the company at year-end. One should always endeavor to make the innocuous seem conspiratorial. Of course one might argue that in the someone opaque world of global reinsurance the conspiratorial is at least mundane if not exactly innocuous. Author Posted on November 10, 2010 June 6, 2012 Categories Insurance, Insurance Law, Insurance Regulatory Reform, regulation, Reinsurance4 Comments on Europeans Seeking Reinsurance Solvency again! Once again the politicians in Washington are oblivious to the needs of the citizens they are supposed to be representing. We hear about bipartisanship and this is a situation that is truly bipartisan. Both parties are playing pure politics with the failure to extend the NFIP. This may not seem like a big deal to many folks, but by not having access to Flood Insurance the impact is rippling throughout our economy. Lenders will not close on loans without Flood Insurance in flood prone areas, which means every coastal community. 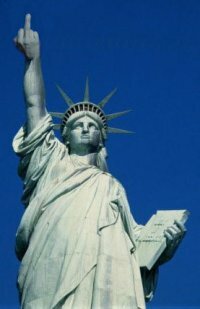 Are there some legitimate arguments against the NFIP as it is currently structured? Absolutely, it is $19 billion in debt. This is due to the fact it is like most insurance pools and funds regulated by a governmental agency, federal or state. The rates have not been adequate as it is a “take all comers’ program. This should not be a surprise as it is a government program with all the built in deficiencies that come with that structure. In the scheme of things in Washington when does $19 billion matter to a politician inside the “Beltway”. That is not the reason. The reason is everyone wants to pass the extension of the NFIP and it is a good “hostage” to hold to try and garner votes for other issues. This is why the politicians won’t do what is right and just pass some stand alone legislation. Bad Faith Insurers Safeco (Liberty Mutual) and Republic coming to scam coast residents. Safeco Insurance plans to offer wind coverage again, Mississippi Insurance Commissioner Mike Chaney said Monday morning. The company will offer 500 to 1,000 homeowner policies with wind coverage, he said, beginning in mid-March. “They’re going to be selective about who they write, but I’m assuming as long as there’s not a credit risk involved, they’re not going to have any real restrictions,” Chaney said. Some companies have restricted wind coverage to the northern three Coast counties, but stopped offering it to new customers or nonrenewed policyholders who live near shore. Author Posted on March 2, 2010 Categories Insurance, SopTags American Financial Group, Captured Regulator, Liberty Mutual, Mike Chaney, Mississippi Insurance Department, Republic, Safeco3 Comments on Bad Faith Insurers Safeco (Liberty Mutual) and Republic coming to scam coast residents. As one might guess, the title of this post was inspired by my bulging drafts file and the incredible interest in Sop’s coverage of what first appeared a simple case of insurance lagniappe in Jefferson Parish. First up, a collection of news stories that remind us risk is not limited to the states on the Gulf Coast. Two snow storms that hit the United States this month will cause insured damages in excess of $2 billion, according to a catastrophe risk modeling firm…Meanwhile, Gary Kerney, assistant vice president of Property Claim Services, a unit of Insurance Services Office in Jersey City, N.J., said he expects PCS to have loss estimates for the storms sometime next week. He said PCS is classifying both storms as catastrophes, meaning each storm should have insured losses in excess of $25 million. "Insurer Zurich noted that snow has been present in 49 of 50 states in the past week, and some states not used to facing this risk could be exposed to losses." AIR Worldwide issued a statement on Feb. 10…noting that business interruption is likely to be another major driver of insured losses. Regarding roof collapse claims, Tim Doggett, principal scientist, AIR, said the combined storms could cause havoc for roofs, particularly light metal, long span, low slope and flat roofs. According to the Insurance Information Institute, winter storms are the third-largest cause of catastrophe losses, behind hurricanes and tornadoes, and result in about $1 billion in insured losses each year. I.I.I. said winter storms resulted in more than $7 billion in insured losses from 1999-2008. Well, &#*% happens, snow melts, and levees may fail to provide protection from flooding. 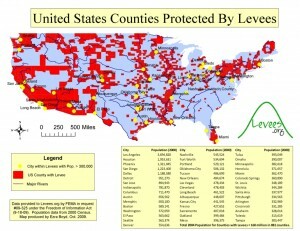 New data released by Levees.Org shows that the majority of U.S. population lives in counties protected by levees, and that those counties are wealthier. Providence officials estimate the transfer will save the city $500,000 annually and millions more in upkeep over the course of the coming years…In addition [to the legislation authorizing the transfer], [U.S. Senator Jack] Reed helped secure $4 million in federal funding for the Corps to make repairs to the barrier’s pumping system and has arranged nearly $1 million to operate the barrier over the last two years. “Policyholders should be aware that Mississippi law provides that insureds have an affirmative duty to read a contract of insurance and are bound by the contents thereof”, according to the Mississippi Insurance Department’s (MID) Policyholder’s Bill of Rights (PBOR). Merriam-Webster’s Dictionary of Law defines affirmative duty as, “involving or requiring the application of effort”. In other words, what the law actually requires is that insureds make an effort to read their insurance contract. What a relief! An important study, by Forrest E.Harding in the Journal of Risk and Insurance in 1967, found that a specimen auto policy was substantially more difficult to read than Albert Einstein’s The Meaning of Relativity. In response to urging by consumer groups, Plain English advocates, and regulators, insurance companies began to revise and simplify their contracts as far back as the 1970s—some voluntarily, some in response to state laws. 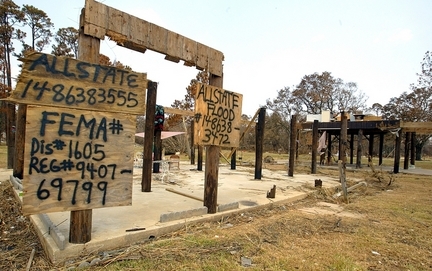 How many count a good credit rating among their losses from Hurricane Katrina? Logic suggests more than just a few. Everything in thousands of homes had to be replaced; income, and in some cases, jobs were lost; and, as SLABBED readers know, there are insurance claims that have yet to be paid and untold thousands underpaid. In a weekend Sun Herald story, Bad credit can mean higher insurance premiums, Anita Lee reports the latest bite-you-in-the-behind news that makes Katrina, the Hurricane that keeps on giving to those on the Coast who saw their credit score go south following the storm. Coastal policyholders are well aware a hurricane is guaranteed to hike insurance rates, but fewer realize their credit reports also are factored into homeowner and automobile insurance premiums. Insurance companies contend consumers with bad credit tend to file more property insurance claims. Consumer advocates question the accuracy of studies that find a correlation between credit and risk. Merlin: Endorsement Trumps Exclusion – Hurricane Anticoncurrent Causation Case and Policyholder Wins! Of controlling significance is the fact that in every such case, without exception, the respective courts interpreted concurrent cause exclusions as they appeared in the insurers’ basic policies, determining only whether a cause of loss otherwise covered by the basic policy was excluded from coverage when it occurred concurrently with a cause of loss excluded in the basic policy. None of those cases addresses the modifying language of an extra-cost endorsement on the language of the basic policy, the ambiguity that it created or the reasonable expectations of an insured in light of that ambiguity. Thus, those courts did not confront the linguistic interplay we address here. Consequently, they were able to find the language of the concurrent cause exclusion unambiguous as it applied to claims made under the basic policy. Given the language they considered and the circumstances to which they applied it, we might well have reached the same conclusions. Nevertheless, those scenarios are not before us. Accordingly, we do not find these cases Penn National cites apposite to our disposition. Author Posted on January 21, 2010 Categories Hurricane Katrina litigation, InsuranceTags Bishop Inc v Penn National, extra cost hurricane endorsement2 Comments on Merlin: Endorsement Trumps Exclusion – Hurricane Anticoncurrent Causation Case and Policyholder Wins! 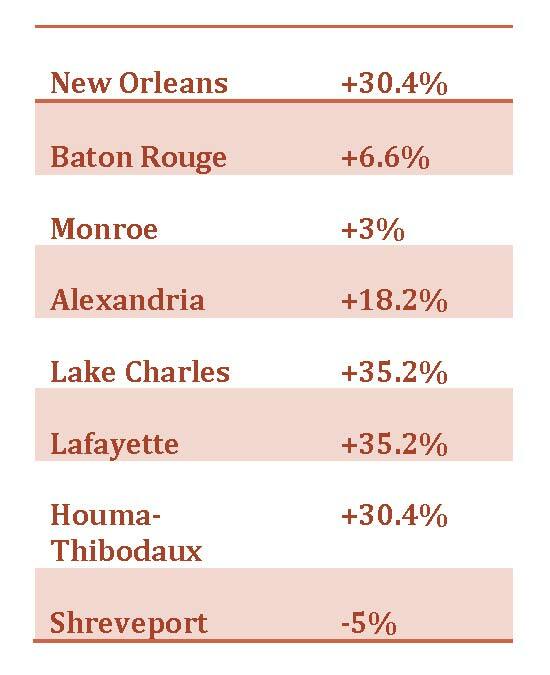 What a coincidence – State Farm files for 19% rate increase in Louisiana! After MID awarded State Farm a 19.5% rate increase, the Company decided to forgo the shock ’em first approach it brought from Florida Mississippi- …and the score in the State Farm game was 45-19.5…– and go with a 19% requested increase in Louisiana. The Times-Picayune carried the AP story; but, hanging on Editilla’s Ladder was the more detailed story in the Daily Comet. “State Farm, Louisiana’s largest homeowners insurer, has asked regulators for a 30 percent rate increase for policyholders in Terrebonne and Lafourche parishes. Coastal parishes would take the brunt of the proposed increases, which average 19.1 percent statewide. Author Posted on January 8, 2010 Categories Insurance, Louisiana Insurance Commission, State FarmTags Louisiana Insurance Commission, Mississippi Insurance Department, rate increase, State Farm, State Farm Florida, State Farm Mutual re State Farm FireLeave a comment on What a coincidence – State Farm files for 19% rate increase in Louisiana! Officials say the Mississippi Insurance Commission has rejected a company’s request to increase rates 65.1 percent on more than 50,000 homes statewide. Deputy Insurance Commissioner Mark Haire says the rejection order was sent Thursday to AllState Property and Casualty Insurance Co. of Northbrook, Ill.
Haire said Mississippi Insurance Commissioner Mike Chaney made the decision after specialists reviewed the request and found the large increase was not justified. The requested increase would have covered 51,097 homeowners. Haire said AllState has the option of having a hearing on the matter or filing a new request for a lower increase.